Iran, Syria, Russia on the Human Rights Council? GlobalMemo.org is happy to welcome Melissa Kaplan as our newest contributor. She will be keeping an eye on this year’s elections to the Human Right Council and sharing her expertise and reactions on the race with our readers. Melissa starts off with a critical eye on potential Council candidates for which “human rights” is…shall we say, differently defined? At the United Nations, election season is around the corner for those countries seeking membership in the U.N. Human Rights Council (HRC). The elections are still a few months away—set for November 12th—but some rumored candidates have already drawn controversy. The HRC has 47 members, drawn from the UN’s five regional groups. This year, the African group has four of its 13 seats open for election. Asian-Pacific states will fill four of its eight seats. The Eastern European, Latin American and Caribbean, and Western European and Others group will each have two seats open for election. States are elected for three-year terms if they secure support from a majority of UN General Assembly members (97 votes presuming all members vote). Iran and Syria made headlines—and drew sharp reaction from the U.S. ambassador—when rumors began circulating that they would run for the two of the four Asian-Pacific seats on the Council despite their records of human rights violations–and in the case of Syria, a brutal, two-year civil war in which tens of thousands are known to have been killed. Iran has since announced it will not run for a seat, and Syria is not yet officially listed as formal HRC candidates on the Council’s elections webpage. The Asian-Pacific region already has five declared candidates for four available seats: China, Jordan, Maldives, Saudi Arabia, and Vietnam. This competitive slate, as well as international outrage, will presumably keep Syria’s candidacy from gathering much steam. But China, Saudi Arabia, and Vietnam each have their own imperfect records when it comes to human rights. The election of states from the Asian-Pacific region will prove worth watching. Another potentially problematic candidate is the Russian Federation, running for one of the two Eastern European seats (the former Yugoslavian Republican of Macedonia [FYROM] being the other candidate). Persistent headlines surrounding Russian human rights violations under President Vladimir Putin’s regime are likely to draw criticism of Russia’s seeking a spot on the Council. At the moment, Eastern Europe has a non-competitive slate, with only Russia and FYROM running for the region’s two seats. 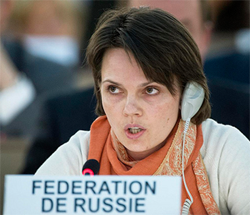 In its formal statement, the Permanent Mission of the Russian Federation to the U.N. lays out grounds for its candidacy (despite the problems at home), highlighting its ratification of several core human rights treaties including the Convention on the Elimination of All Forms of Discrimination Against Women (CEDAW), the International Covenant on Civil and Political Rights, and the International Convention on the Elimination of All Forms of Racial Discrimination. (It is not yet however a party to the Rome Statute for the International Criminal Court). It also spells out what some of Russia’s priorities on the HRC would be, including fighting human trafficking and “combatting racism, racial discrimination, xenophobia and related intolerance at the international level.” The permanent mission is leading the campaign promotion on its website and via Twitter. It is a deeply unpleasant, though not unprecedented prospect to have human rights violators serving on the Council. How these countries’ candidacies play out over the next several months—and how other states within their regions and in the wider UN membership react—will be quite interesting to follow. Melissa Kaplan is advocacy manager for aid reform and effectiveness at U.S.-based NGO network InterAction. Prior to joining InterAction, Melissa was deputy director of Government Relations and Citizens for Global Solutions from 2010 to 2012, where she managed congressional outreach and advocacy efforts on several issues, including U.N. funding, genocide prevention and the International Criminal Court.